MAP Loyalty Program: Earn $ 6.80 Toward Next Purchase! Imagine pressing your clutch pedal at a stop light and it just sticks to the floor. You're stuck sitting in traffic and can't move. A broken stock clutch master cylinder is an embarrassing and dangerous situation that you will probably face if you have an aftermarket clutch installed. To prevent a failure like this from happening, the AMS EVO X Clutch Master Cylinder Upgrade Kit is a must for your Evolution X! The plastic clutch master cylinder on the 2008+ Evolution X has been known to fail when an aftermarket clutch is used. The increased clamping force provided by aftermarket clutches puts an increased strain on the hydraulic clutch system causing the factory master cylinder to split open and lose pressure leaving you stranded. By adapting the factory steel unit from an EVO VIII/IX, we are able to prevent a failure associated with increased fluid pressure from aftermarket clutch kits and spirited driving. Like all AMS products, we set out to create the best solution possible. AMS Engineers utilized AutoCAD and a CMM arm to precisely measure the factory EVO X master cylinder and firewall itself in order to machine a counter-bored adapter plate that fits flawlessly. In addition, we made a system that installs easily and includes all necessary hardware as well as detailed installation instructions. Our engineers looked at all aspects of our Upgrade Kit to improve longevity and ensure this is the last clutch master cylinder you will ever buy for your Evolution X. The adapter bracket is anodized to prevent corrosion and we chose to incorporate a steel ball-cup link for strength and durability. The design also uses a nylon coated, stainless braided, Teflon hydraulic line for maximum reliability and abrasion resistance. Our engineers paid close attention to every detail, even incorporating a sealing foam ring to keep moisture and dirt out of the passenger compartment. 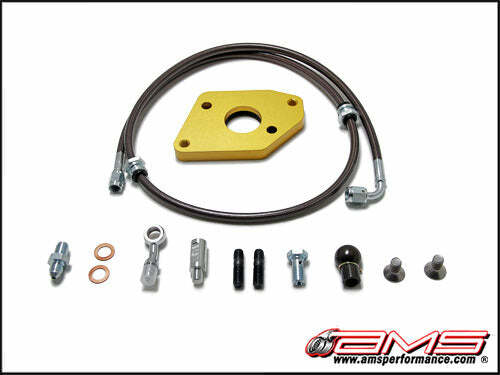 The AMS EVO X Clutch Master Cylinder Kit comes fully assembled with an OEM EVO VIII/IX clutch master cylinder. The kit is also available without a clutch master cylinder for customers who wish to source their own. Aluminum adapter plate with gold anodized finish. Sealing Foam Ring to keep out moisture and dirt. Sealing area is counter-bored to fit snug against the firewall. Must get this up grade for the Evo x with an upgraded clutch !! Definitely Recommend!!! This is built great not like the cheapo oem one. Buy it now so you have some peace and mind when driving around. Oem went on me at a red light *cue puckered booty. Now that this is installed I think clutch feels better and in fact a little smoother. Great product, ships fast, just get it.